A woodsy base note to keep your essential oil blends grounded. Frankincense is an aromatic resin that has been used for 5,000 years for its medicinal and fragrant properties. Sometimes known as one of the gifts the Magi brought to Jesus, frankincense was used in religious and spiritual rituals all over the world. 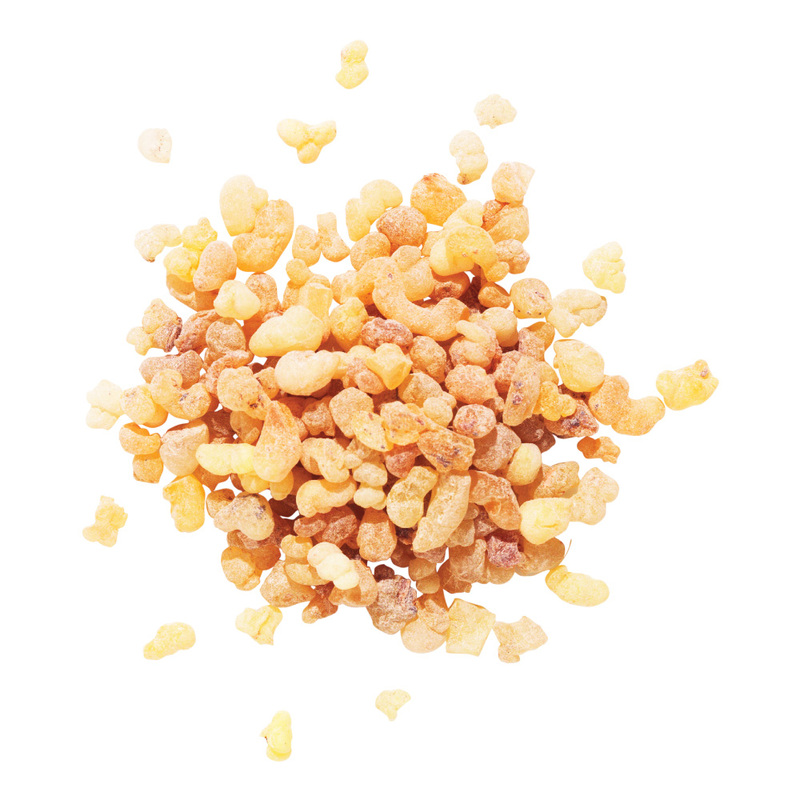 Now a popular ingredient in skincare, frankincense has a warm, woodsy and spicy aroma that grounds and calms the mind. Boswellia trees (which produce frankincense) grow only in Southern Arabia, India, and Northern Africa. In ancient times, the popularity of frankincense and the the limited growing area for the trees made this region of the world very wealthy. They prefer a limestone-rich soil, and often grow in awkward places like rocky hillsides and cliffs, which make harvesting the valuable frankincense a dangerous task. Boswellia trees are scrubby deciduous (they lose their leaves once a year) trees that can grow to 2 to 8 metres (7 to 23 feet) tall. Similar to how maple syrup is made from tapped tree sap, frankincense is harvested from Boswellia trees twice a year. The tree bark is cut, allowing the white, milky sap to seep out. As it dries, the sap hardens into frankincense, a resin that can be chopped off the tree in chunks. The chunks of frankincense can be burned as incense, or processed into essential oil. Chunks of frankincense range in colour from silvery-white to brown, and look a bit like small pebbles, or irregular gummy candy. To make frankincense essential oil, the resin is crushed and steam-distilled. In traditional Chinese medicine, frankincense is known as Ru Xiang, and is considered to be acrid, bitter in flavour and warm in nature. It is believed to enter the heart, liver and spleen channels. It is thought to invigorate the blood, promote the movement of Qi, and stop pain. Used in religious and spiritual rituals for thousands of years, frankincense is a symbol of holiness and righteousness. Because it is so fragrant when burnt, it was used by ancient people as a religious offering. In Christian symbolism, frankincense can represent Christ’s sacrifice. In magical traditions, frankincense is associated with the element fire, the Sun, and is thought to be masculine in nature. In ancient Egypt, frankincense was burnt to honour Ra and Baal. Frankincense is thought to have strong vibrations that drive away negative energies when burned, and is therefore very useful in spiritual rituals and meditation. Frankincense has been traded in Somalia, North Africa, and the Arabian Peninsula for more than 5,000 years, and has played an important part in the economic and spiritual history of the world. In ancient times, the development of frankincense trade routes helped make Southern Arabia very rich. In fact, in 100 AD, the Roman botanist Pliny the Elder said that trade in frankincense had made the Southern Arabians the richest people in the world. The need to transport frankincense quickly and easily may have help spur the domestication of camels as a pack animal. Camels are ideally suited to carry heavy loads (like frankincense) long distances across the desert. In Egypt, a mural in the temple of ancient Egyptian Queen Hatshepsut, who died in 1458 BC, shows stacks of frankincense being traded. The Egyptians used frankincense in many ways: as a key ingredient in embalming; for incense, insect repellent, perfume and salves for wounds and sores. It was also used as an ingredient in kohl (eyeliner), which may have helped protect Egyptians from the glare of the sun, desert dust and eye infections. There are many mentions of frankincense in the Hebrew bible. Gold, frankincense and myrrh (also a type of tree resin) were the gifts given to baby Jesus by the three wise men. The Roman Emperor Nero (the one who famously fiddled while Rome burned) is said to have burned an entire year’s production of frankincense at the funeral of his favourite concubine. This totally disrupted the frankincense economy for a year, until the next harvest. In the Middle Ages, the Franks (the people of what is now modern France and Germany) popularized frankincense in Western Europe. A common theory is that frankincense gets its name from the Franks, but in fact, its name comes from the Old French term, fanc encens, literally meaning “high-quality incense”. Today, frankincense continues to be used around the world in traditional medicine, in religious rituals, and as a valuable perfume and incense.